The Galaxy S Duos 2 (GT-S7582) is an upgrade over the previous-gen device with a 1.2GHz dual-core processor keeping the same amount of RAM but running Android 4.2.2 Jelly Bean with an updated TouchWiz UI. The Samsung Galaxy S Duos 2 retains good build quality as well as the camera. But the original Galaxy S Duos was severely loathed due to performance issues and laggy in almost everything it did. So, does the new iteration suffer from the same issues? Is 768 MB RAM too less for the bulky TouchWiz UI? Here's the PhoneBunch review of the Samsung Galaxy S Duos 2 to answer all your questions. The new iteration comes with a 1.2GHz dual-core processor, 768 MB RAM and a superb 4-inch WVGA display. There's a 5-megapixels camera at the back with a bright LED Flash capable of 720p video capture at 30 FPS alongwith a VGA front-facing camera. There's a hot-swappable micro SD card slot which is a welcome reprieve from removing the battery everytime you need to change your micro SD card. Samsung's signature physical home button finds a place on the S Duos 2 S7582 as well alongwith two capacitive buttons for Menu and Back flanking it. It has a 4GB ROM out of which about 1.9 GB is available to the user. However, apps are movable to the SD card but app data still needs to reside in the internal storage. USB OTG is not supported on the Galaxy S Duos 2. The graphics of the phone are powered by VideoCore IV from Broadcom which proved upto the task of handling mid to high-end games but is no match to the Adreno 305 of the Xperia M.
The GPS on the Galaxy S Duos 2 is quite good as well and it geo-located our precise location within a matter of seconds after turning it on right out-of-the box. Its a dual-SIM smartphone in which you can use a 3G SIM card on either one of the two slots but only one SIM card may use a 3G network at any given time. The S Duos 2 is a dual-standby device, meaning if you are getting a call on one line the other line would not be reachable, however Samsung has added a feature called Smart Dual SIM mode which allows you to receive calls on both SIM cards at the same time. But this is not supported on all networks. On left of the phone you have the volume rocker, its sturdy and doesn't creak. On the right, you have the power lock/unlock button as well as the hot-swappable micro SD card slot which is tucked away under a small flap painted in the likeness of the faux metal band that runs on the sides of the device. The buttons too are painted in the same finish. The faux metal sides look premium and is a bit raised over the front-panel so that the display never comes in direct contact when the phone is kept upside down on a flat surface. At the top you have the 3.5 mm audio port while the primary microphone and micro USB data-syncing/charging port can be found at the bottom. Moving to the back you have the 5MP AF camera with a bright LED flash just below it and the speakerphone on its left. The speakerphone is loud, clear and the grill around it is a bit raised so that the sound doesn't get muffled even when the phone it put on its back on a flat surface. The backcover has a textured finish which makes the phone feel premium and it doesn't flex much, atleast not when its on the phone. But it is a bit difficult to remove, you get a feeling that it might break if you apply too much pressure. On the inside the SIM card slots are stacked on top of each other. The front is covered in a solid glass panel with spaces for the earpiece and the physical home button, which too is solid, doesn't make any noise but is a bit stiff. The display is housed just beneath the glass panel without any noticeable gap, the touch response is excellent but the glass is a bit of a fingerprint magnet. Therefore a screenguard would be must. The two capacitive buttons for Menu and Back do light up but there's no notification LED on the phone. We didn't face any issues with network on the S Duos 2 even with both SIM cards plugged in. Calls were crisp, clear and loud on both the earpiece as well as over the loudspeaker. There was no echo or disturbance on the line. Network retention was high and the phone retained signal strength quite well throughout our testing. People on the other line too were able to hear us well without reporting any loss of clarity or echoing. The customized dialer Keypad as well as call logs and contacts apps are particularly useful. The dialer or phone app allows you to find contacts using T9 search and the call logs as well as contacts interface allows you to make calls by just swiping from left on a contact or send a message by swiping it from the right. The phone also supports 3G video calls which is not available on the Sony Xperia M.
3G Speeds are within acceptable limits and 2G data download speed is above average. The display is vibrant with excellent color reproduction. Yes, just like most Samsung smartphones colors seem a bit over-saturated, but I am a bit partial to that. Sunlight visibility of the display is high, but the brightness could have been a little higher. There's no auto-brightness so you would have to set the levels according to ambient light or you can leave it around the halfway mark. Touch response of the S Duos 2 is brilliant although the display supports only 2 points of touch. Animations sometimes do feel a bit sluggish but its not a performance issue, mostly its just the TouchWiz UI. Everything seems to take its own sweet time to get through and sweet time it does take. There's no ghosting at higher frame-rate especially in games. The contrast levels of the display are high, blacks are dark and in general everything looks better on this display. The Galaxy S Duos 2 has an excellent camera. Images taken are sharp, vibrant with good albeit a bit over-saturated color reproduction. The flash works great, although low-light imaging is filled with noise and artifacts. The camera interface is really intuitive and has several modes including "Sound & shot" which was introduced with the Galaxy S4. It lets you capture background sound alongwith the image. Then you have Auto, Continuous shot, Panorama, Best photo, Sports and Night modes. You can capture crisp 720p videos at 30 FPS with almost zero ghosting but there is a little bit of motion blur. Here are the video and image samples, you can find full-res images on our Google+ page. First of all, the bundled earphones are excellent. They are the same ones that came with the Galaxy Star. They are great for listening to music as well. Music playback is flawless, the interface is slick and easy to use. The speakerphone although not that loud is able to distinguish between mid and high tones, but lower tones still get muffled in the mix. Nevertheless, the speakerphone sounds good especially compared to similarly priced handsets. FM Radio reception is good but its best feature is recording. The recordings sound good and you also have the option of selecting their default storage. You also have RDS to display channel information. The S Duos 2 can play 720p videos at 30 FPS without a stutter. There's no blur or ghosting, MP4 and 3GP files are supported out of the box. You can play 1080p videos using MXPlayer alongwith several other video formats. There's an Auto Video shut-off option using which you can set the time after which the video player will close. The speakerphone is clear but could have been louder. It doesn't get muffled when put on a flat surface since the grill around it is raised. Sound quality is good and it doesn't crackle at full volume. Calls through the speakerphone are clear without echo and no distortion. There's nothing stock or vanilla about the interface of the Galaxy S Duos 2. The interface is as alien to stock Android as can be. Its bulky, seems resource intensive and is just plain slow, but not from a performance standpoint, its designed to be slow with slow-mo animations. But it does have its moments, where it is definitely more useful and to some extent more intuitive. Consider the app drawer where you can see downloaded apps separately or arrange apps according to your choice. You can also create folders in the app drawer, directly uninstall apps, hide them or change the view type to a list. If you plug-in your headset, a set of apps that can use the headset come up automatically in the notification drawer. Notification toggles can be added or removed, which is something we would like to have in stock Android as well. The SIM card manager is particularly useful, where you can choose the SIM card to use for Voice calls, Data and Video calls. You can also enable 3G on any SIM card here, but for only one at a time. You can also add shortcuts to the lockscreen which will open the respective app once the device is unlocked plus you can have different wallpapers for the homescreen and your lockscreen. But that's not all, you can also set different wallpapers for both SIM cards, which will change when you choose one or the other as the primary SIM. You can use Ripple or Light effects for your lockscreen as well. There's a handy Blocking mode as well using which you can Block incoming calls, notifications as well as alarms at a particular time or always when the option is selected. The Galaxy S Duos 2 also has Gesture support. Using Smart alert you can make the phone display missed calls or unread messages as soon as you pick up the device. You can also enable Mute/Pause option which allows you to mute the phone when you get a call by just turning the phone over. Web browsing performance is good, atleast in terms of webpage load times. But the scrolling is painfully slow, and its a continuing theme throughout the interface. Pinch to zoom works great, there' s no lag on even heavy websites with lots of images. You can use Pattern, Pin or Face Unlock to secure your device. The Galaxy S Duos 2 also has an option to enable Remote services using which you can remotely lock, find or wipe your device. Its baked into the OS. You can also encrypt your device storage as well as SD Card for more security. The VideoCore IV graphics engine is capable of playing most of today's high-end games at low-medium settings. We played several games on the Galaxy S Duos 2 including Asphalt 8, FIFA 14, Riptide GP2, Frontline Commando D-Day, Dead Trigger 2 among others. All games played smooth, but we had to make room to install games because even though apps are movable, app-data still needs to be in the internal storage which is about 1.9 GB when you get the phone. Therefore, you can never install a game that requires more then 1.9 GB of storage. Although 768 MB of RAM might seem less for high-end gaming, but the S Duos 2 makes do without any major hiccups. The Galaxy S duos performed brilliantly in our benchmarks, surpassing most dual-core processor based smartphones from Indian manufacturers. But TouchWiz just makes the phone feel slower. The animations make things feel slow to the extent that you are actually left waiting for things to load. Scrolling too is a bit slower and seems like a task if you are browsing long webpages. Battery life is average, you can easily get a day's use with some gaming, music playback and web browsing on WiFi. We got one day of usage after which we had to charge the phone at night. Our test includes 2G internet always on with Sync on for all services including Gmail, Facebook, Twitter and WhatsApp, gaming for about 30 minutes, browsing internet for about an hour on WiFi, listening to music and watching local videos for about an hour alongwith streaming video from YouTube for about 30 minutes. Our usual day parameter also consists of 20 minutes of voice calls without the use of the speakerphone. Therefore, even with heavy usage you can expect the phone to last you a full day, but you will be searching for the charger at the end of the day. In our view the Galaxy S Duos 2 is one of the best smartphones you can get under Rs. 10000. It has good build quality, excellent 5 MP camera and overall good multimedia capabilities. There's no major issue with the S Duos 2, apart from TocuhWiz which just seems a bit bloated and heavy. The phone however, is easy to use with a vibrant display and good touch response. The Samsung Galaxy S Duos 2 at present seems a better device than the Xperia M and even the larger Galaxy Core. Indian manufacturers should take a lesson from Samsung and instead of pushing for quad-core processors in lower price brackets they should focus on build as well as the quality of materials that go into making the phone. 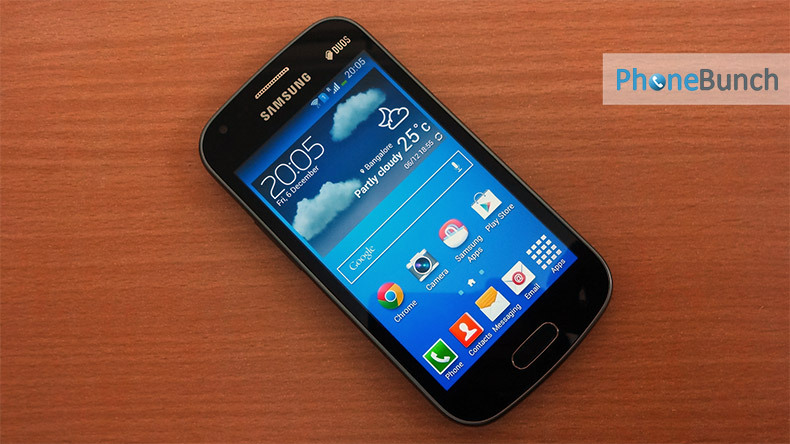 Therefore, we are going with a 8.4 / 10 for the Samsung Galaxy S Duos 2 S7582, its a worthy upgrade.